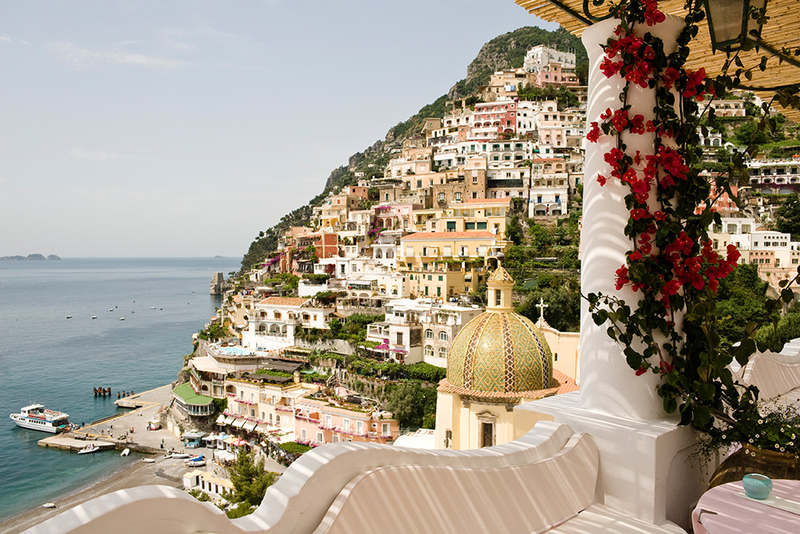 The view from the terrace of Le Sirenuse, Positano, Italy. Photograph by Stefano Scatà. The insider travel advice on this page is from one of Wendy’s Trusted Travel Experts for Italy: Andrea Grisdale of IC Bellagio. Armed with decades of experience in Italy (she lives on Lake Como) and the vast list of contacts in her little black book, Andrea can open the doors that are closed to most people (not, alas, George Clooney’s) and satisfy most any request. She interviews travelers in depth to gain a thorough understanding of their travel fantasies, preferences, and pet peeves, and uses that knowledge to craft an itinerary that pairs you with the perfect hotels, activities, guides, and even drivers. A bilingual former guide herself, Andrea knows every time-saving trick for seeing the most famous monuments while also squeezing in the hidden gems. She and her team have the clout to pull strings and ask for favors at Italy’s best hotels, and they have a track record of coming to the rescue 24/7 should the need arise. 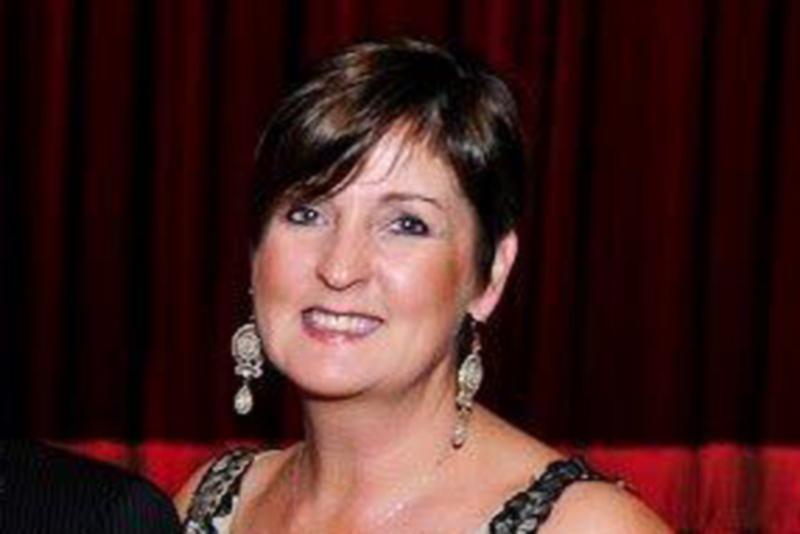 Andrea was also included in Perrin’s People, Wendy’s award-winning list of top travel specialists, which was published annually in Condé Nast Traveler magazine from 2000 to 2013. One of the best values in all of Italy—not just the Amalfi Coast—is the Palazzo Murat Hotel. This four-star property has a fantastic location in the heart of Positano, just above the Santa Maria Assunta Church—but with a lovely garden that feels like an oasis amid the hustle and bustle beyond its walls. Choose between rooms in the 18th-century wing (once the residence of a past king of Naples) or in the modern addition; my favorite is the Special Superior Room, a new room on the second floor with a terrace overlooking the countryside and the gardens. There’s also a small pool, which is unusual for the area, and the restaurant serves and enviable breakfast with some of the tastiest pastries in the country. The hotel’s owner is happy to meet my guests for a drink, or take you on a walking tour of Positano. Hotel Le Sirenuse. Yes, the rates here are dizzying, but for everything your money buys you, the standard sea-view rooms ($1,350 in high season; $800 in low) are an excellent value. 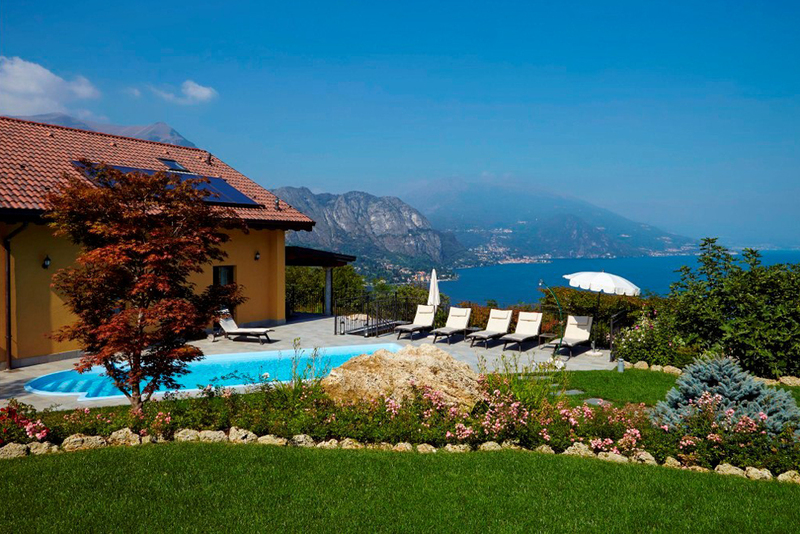 They’re comfortable and have stunning views, and the amenities and services at this fabled, family-run Amalfi Coast hotel are beyond compare. Our clients enjoy an exclusive back-of-the-house tour with the owner (or manager, if the owner is absent). With so many hotels completely booked during high season, we can also offer our clients the option of spending the night in Amalfi Port on one of our 60-foot private luxury boats, which also gives you the advantage of going to dinner at restaurants only reachable via sea (the Captain also sleeps on board, in a separate area). Trattoria da Gemma opened in Amalfi in 1872 and has been a favorite among locals ever since. The entrance is just off the city’s main thoroughfare, up some well-worn steps. There are some tables along the steps, and more inside the elegant dining room. Much of the food is locally harvested. The lemon risotto with shrimp, fritto misto with crispy zucchini fries, and paccheri pasta are amazing. And if you love desserts, you’ll be in heaven. 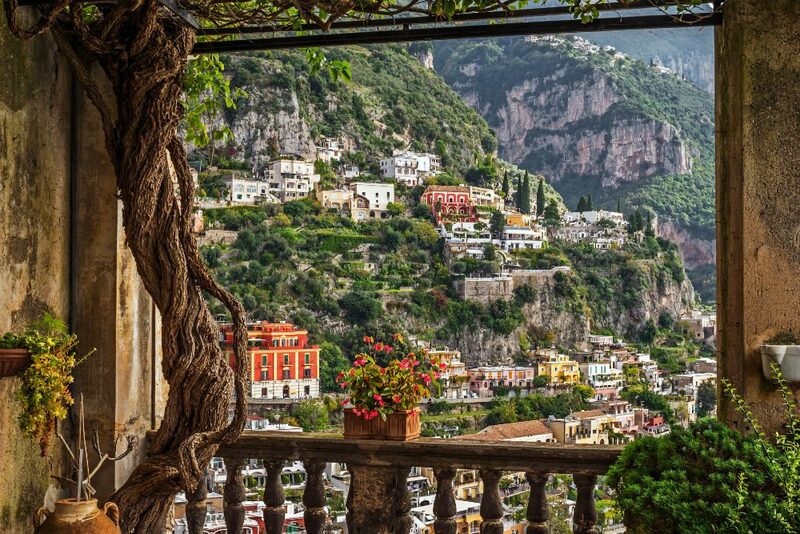 Locals head to the hillside village of Scala, just outside Ravello, for the extraordinary desserts and masterful meals served at Trattoria da Lorenzo the sort of beautiful little eatery most people imagine when they think of a traditional Italian trattoria. Fish is the house specialty, but the pastas are also excellent—and plentiful. Be sure to sample the amazing local cheeses and figs accompanied by wonderful homemade jams. Ristorante Torre Normanna, in the center of Maori, is a local favorite specializing in typical Campania and seafood fare. Its vegetarian dishes are every bit as good as its meat and fish offerings, which is saying a lot. In the village of Sant’Agata sui Due Golfi, between Sorrento and Positano, Don Alfonso 1890 is a destination in itself. Considered one of Italy’s top four restaurants, Don Alfonso serves dishes so beautifully composed they could be considered art, in a sleek setting right out of La Dolce Vita. After a meal that might include rigatoni “Vesuvio” or pasta with mussels and tuna botargo, you can stop by the shop for some bottled sauce or fine olive oil and can even spend the night in one of the suites if you’ve eaten too much to endure the winding roads home. Throngs flock to see the ruins at Pompeii, but Herculaneum—which was also wiped out when Vesuvius blew its stack in 79 A.D.—is arguably better preserved and largely overlooked. The huddled skeletons of people buried by burning ash while waiting for boats to carry them to safety is just one of the haunting and indelible sights here. 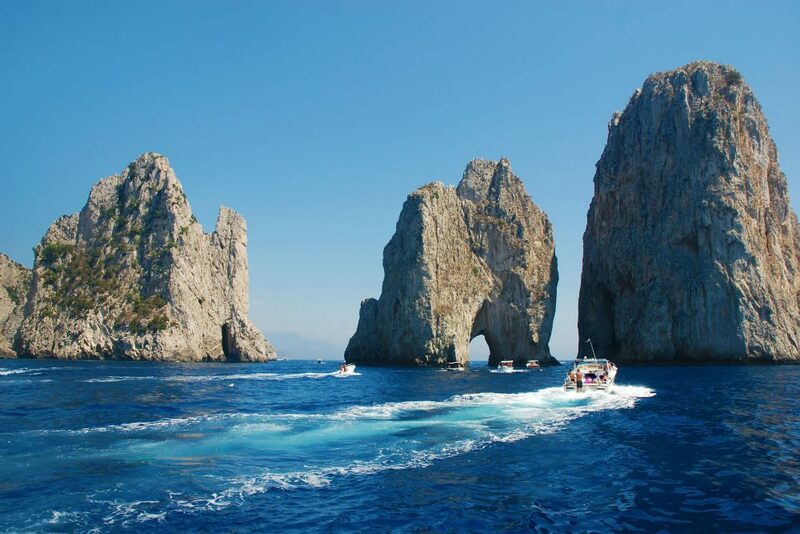 The Blue Grotto is Capri’s most popular attraction and stunning to behold, but you’ll pay a lot of money and wait a long time to be rowed around this loud, crowded cave. The entire island is surrounded by equally beautiful grottoes and tiny beaches that are completely overlooked and can be enjoyed privately and in your own sweet time. La Conca del Sogno is a fantastic open-air restaurant and inn hidden in a corner of the Cove of Nerano and reachable only by boat or on foot. However you get here, you’ll be treated to some of the best and freshest Mediterranean food you will ever taste. The pasta with zucchini is especially memorable. Wake up early to have a breakfast of cappuccino and brioche with the locals at a neighborhood café. One of the best is Amalfi’s Pasticceria Pansa, near the Piazza Duomo, which has the best coffee and pastries in town. Don’t be afraid to consider Naples. Sure, I wouldn’t recommend walking around dripping with diamonds or a big Rolex watch, but that’s true of any large city. Naples is one of the most fun, energizing, culturally interesting cities in the world, with great shopping, fabulous people, and incredible history (its Archaeological Museum is said to be one of the best in the world). One of our favorite guides there will invite you into his life for a day: Enjoy a cappuccino and brioche with him as his favorite morning bar, meet his mother in her home, then walk his favorite corners of the city, understanding what it was like to grow up here—finishing, of course, with the local specialty in one of the city’s most historic pizzerias. Fine tailoring is a time-honored Neapolitan tradition; Naples had its own tailors’ guild as far back as 1351. Go behind closed doors at one of Italy’s premier menswear companies, Isaia Napoli; you’ll get exclusive access to the bustling workshop, staffed with artisans expert in the age-old Neapolitan tailoring tradition, and to the personalities behind this iconic brand (including Gianluca Isaia—grandson of the founder—if he’s in town). Choose the silk for your very own souvenir tie or clutch, which will be completed and presented to you before you leave. Take a step back in time with the Mule Men. High, high above the busy towns of the Amalfi Coast, on the steep slopes of the mountains, an ancient network of trails links remote villages. These footpaths are a popular hiking route for visitors, few of whom ever encounter the “mule men,” who work and live as they have for centuries in the heart of the lemon and olive groves that blanket the hillsides. We offer an exclusive window into the world of these locals, as we accompany them—and the mules they use to carry their harvests—on a hike along the trails, sharing lunch, conversation, and laughs, as we learn about their traditional way of life that endures far from the eyes of most visitors. Enjoy (often all to yourself) the many beautiful yet forgotten grottos that line the island of Capri—many of them are on the western side—whilst the masses wait in line to enter the Blu Grotto. Get out on the water in a kayak or, better yet, a boat with a captain, so you have nothing to do but enjoy the sea air and the view and whatever you’ve taken aboard to eat and to drink. Your hotel can provide the kayaks; we can arrange for the boat. Enjoy a hike along the “Pathway of the Gods”: Take in the sights and sounds of the Amalfi Coast from above while mixing with locals as you pass through various villages. October, when the cruise throngs have thinned, hotel prices have dropped (a little), there’s still plenty of sun, and the sea is perfect for swimming. April is also lovely and quiet, though the surf is on the chilly side. The most lively time of year is summer, when the coast bustles and the Ravello Music Festival offers a break from the beach with an international roster of classical, jazz, pop, and dance performers. Whenever you go, the best time of day to visit Capri is late afternoon, when the day tourists have all gone home, it’s much quieter, not as hot, and you can truly relax and enjoy both Capri Town and Ana Capri in a much more relaxed way. November through March, when most of the shops, restaurants, and bars are closed for the season. But even then the weather is pleasantly mild, the locals are welcoming, and Sorrento’s eateries stay up and running. Driving on the Amalfi Coast is best left to the pros: Buses move along the narrow, curving roads at remarkable speed and with little regard for cars; parking spaces are virtually impossible to find. Best to hire a car and driver or take one of the frequent and efficient local buses. A close second is taking the ferry to Capri instead of the hydrofoil. The ferry takes much longer and is a waste of time that would be better spent on shore. And remember: Never buy hydrofoil tickets in advance. If you decide to take an earlier or later departure, you may not be able to use your advance-purchase ticket. Buying at the port allows for much more flexibility. Thinking that Sorrento is part of the Amalfi Coast. It’s actually around the corner of the headland and located on the Bay of Naples. Though it’s a short distance away, you’ll need to allow at least 40 minutes to drive between the two, due to the traffic and the curvy roads. The rooftop terrace of Positano’s Villa Franca Hotel may be the highest point in town and offers sweeping views of the coast and the Li Galli Islands in the distance. The lunch area near the infinity pool at Ravello’s Hotel Caruso is surrounded by beautifully manicured formal gardens and has panoramic views of the azure Gulf of Salerno and its mountainous coastline. The views from the terrace of the Monastero Santa Rosa, which stands proudly on the hillside overlooking Amalfi. The views of the coastline from the best possible place—the sea itself—as you cruise along in your private boat or kayak. Ristorante La Fontellina, in Capri, has stunning views of the Faraglioni, the famous rocks off the coast. The local mozzarella di bufala is the best you’ll ever taste and nobody leaves without at least one bottle of local limoncello. You can buy both at Amalfi’s Bottega dei Ferrari di Luisa Damasco, which you’ll find in an ancient arched alleyway between the Piazza Duomo and the Piazza dei Dogi. Capri is full of handmade sandals, the loveliest of which can be found at Canfora, on the Via Camerelle. You can also snag a gorgeous pair in Positano at Safari, just above the main beach. Beautiful linens can be found in many of the small boutiques, and ceramics too (these mainly in the Ravello area). Make sure you bring an extra bag or leave room in your suitcase for these. Capri Schedule provides ferry and hydrofoil crossing schedules between Capri and Naples, Sorrento, and Castellammare in real time. Will also find the ferry port closest to your location. Capri Insider has recommendations for activities, restaurants, boat rentals, beaches, and beach clubs. The app also offers discounts and freebies at selected businesses. Requires Wi-Fi or data service. 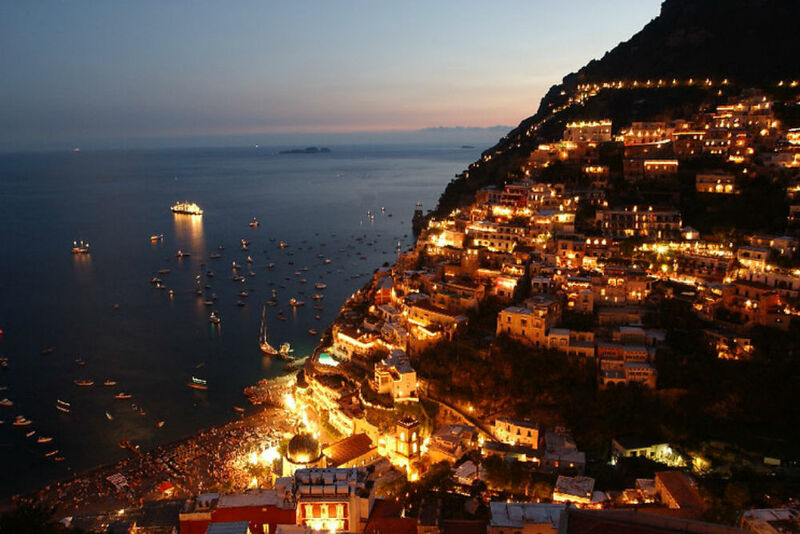 Amalfi Coast Travel Essentials offers a good overview of travel essentials, as well as recommendations on best places to eat, shop, and stay. Naples, the airport closest to the Amalfi Coast, is a very busy place that serves a lot of low-cost carriers, so leave plenty of time to get through security. Do not fly from Naples via Rome to your final destination: It is much easier—and quicker—to drive or take the train to Rome’s FCO airport than to make the connection.